Looking for a unique point of difference on your special day? Speaking Roses offers a new way to personalise your wedding, through its unique flower printer which allows you to print whatever you desire onto fresh, live flowers. We talked to Speaking Roses to find out more. Arun and Dhaval (now the directors and owners of Speaking Roses ) were on the hunt for a new innovative business when they discovered Florabella International (Speaking Roses in the USA). Interested in bringing the franchise to New Zealand, the duo headed to Perth, Australia to see what the flower printing technology could do, and discovered it always printed beautifully on other flowers and edible products too – perfect for people wanting to personalise events and of course, weddings. 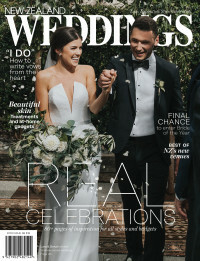 The New Zealand Weddings team had a chat with Speaking Roses to find out more about their unique offering and why it could make for the perfect addition to your special day. Can you tell us a little bit about Speaking Roses? At Speaking Roses, we can print personalised wedding messages or images on fresh flowers. We understand your day is very special, and we offer a very personalised service for your wedding flowers. We custom make beautiful wedding flowers, bridal bouquets and bridesmaid bouquets, the groom’s boutonniere’s, table centrepieces, and accents for anywhere in the ceremony room or hall. From start to finish, our expert designers and consultants are with you every step of the way to make sure it’s perfect. We will design for any wedding, in any setting, make suggestions, or just recreate your wedding flower vision. Why is this something brides should consider when wanting to personalise their wedding day? With a presence in more than 60 countries worldwide, we think it presents the most unique product seen in the promotions and floral industries. Over a decade ago, Speaking Roses conceived the idea to merge the flower and greeting card industries, and created an exceptional way to convey unforgettable messages by making them appear inscribed on the petal of the rose itself. Then, after developing and patenting unique flower printer, Speaking Roses offered beautiful, embossed, flowers to local flower shops and businesses, whose response was immediate and overwhelming. This kind of technology is not available from any other source worldwide – it's created to be personalised and unique to you, everything you'd hope for in your special day. Can you talk us through the process a couple would go through when using your flower printing service? We help the brides-to-be through a myriad of options to choose from in order to find the best way we can help personalise their wedding and make it even more special. Our consultants provide all the help and information they would need to make their decisions. If and where needed we can also personalise their wedding based on their own customised ideas and combined with the rich experience of our consultants come up with an absolutely exclusive and unmatched idea for their wedding day. Can you print on more than just roses? What are the other possibilities? Absolutely! We can print on any flower which has a surface big enough to get a print on, like lilies, daffodils and tulips. We can also print on leaves and edibles, like chocolates, lollies, macarons, fruits and vegetables – perfect for guest favours. Find out more about Speaking Roses by visiting their website or follow them on Facebook or Instagram .